In a world of cyber crime, identity theft and grubby little post office robberies (not forgetting institutional corporate larceny), it is heartening to see that the good old fashioned jewel caper is still alive, well, and working on its tan in Cannes. 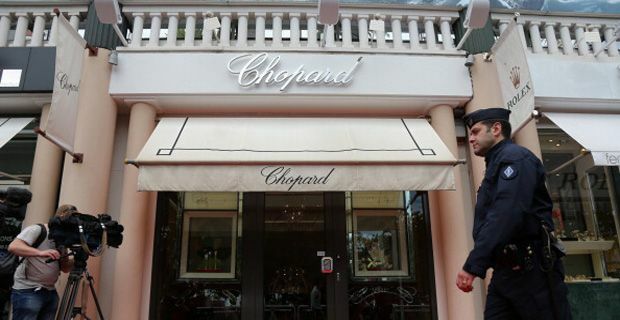 In a plotline worthy of Hitchcock and his impossibly debonair leading man Cary Grant, a safe containing a million dollars worth of gems belonging to the exclusive Swiss jeweler Chopard was robbed from the Novotel in Cannes. The room was occupied by an employee of the firm, which has sponsored the festival for 16 years and is one of many luxury brands who fling priceless shiny things at questionable celebrity during the festival in a bid for red carpet product placement. Possibly the most embarrassing aspect of the whole story is the fact that the jewels had ever set foot in an establishment as firmly mediocre as a Novotel. Chopard must be kicking themselves that they didn’t cough up for a room at the Carlton or the Majestic at the very least. Now, rather than superstars, they are firmly associated with middle to low end Asda suited blandness. Meanwhile, Sofia Coppola was jumping for joy as the whole episode played out as a massive publicity stunt for her new film that is nauseatingly called the Bling Ring. The film is loosely based on a real gang who systematically robbed stars in Hollywood using decidedly modern methods like checking Twitter feeds to see who was out of town. The Cannes Film Festival has had its fair share of dramatic robberies over the past few years with possibly the most amusing – sorry, shocking story being the drugging of Trinny and Susannah who were apparently mistaken for famous people.